I once read a book about 40 years ago that was from the early 1950s. The premise was a scientist working on a "Superbomb" (described as a Hydrogen bomb) in a rural American town/city. An atomic war breaks out and the city is hit. The bomb doesn't destroy the town; instead the town is catapulted millions of years into the future where the Sun is a growing red giant star and humanity is long gone. Aliens find the town and help the folk out somehow. The City at World's End by Edmond Hamilton. First published in the magazine Startling Stories (July 1950), and then printed as a book in 1951, and reprinted on various occasions since. In fact, I just now discovered that you could get an e-book version of it for Kindle, via Amazon's website, as part of a package deal which includes 15 other stories by the same author, conveniently collected in one big "Megapack," all for a mere 55 cents (U.S. money). I own one of the paperback reprints, with the cover art shown below (which may ring a bell for you? ), but I don't have my copy on hand to let me quote passages from it, so I'm going to settle for quoting some material from a lengthy review on Goodreads to demonstrate that you are thinking of the same story I read some years ago. The novel strains the reader's credulity in its opening pages, but if you can get past them alright, and buy into the central premise, you'll be home free. In "City at World's End," the reader is introduced to the small city of Middletown, in Anywhere, U.S.A.; a burg of some 50,000 souls going about their business on a beautiful June morning. What the citizens of Middletown don't know, however, is that its local industrial laboratory is actually the secret working site of a group of atomic physicists, which makes the otherwise undistinguished locale a prime target in a potential war. And before the citizenry is even aware of it, a so-called "super atomic" is exploded right over their heads, knocking one and all off their feet. And that's all! As the populace dusts itself off, it is noticed that the air is now very much colder, and that the sun has changed to a gloomy-looking red ball in the heavens. The moon is now enormous, the stars are visible in the daytime sky, and the lab scientists, by analyzing those changed star patterns, soon come to realize the impossible truth: The city of Middletown has somehow been blown, via a rift in the time-space continuum, millions of years into Earth's future! Put these points of similarity together with your recollection that the story dated back to the early 1950s, and I don't think there's any room for doubt! 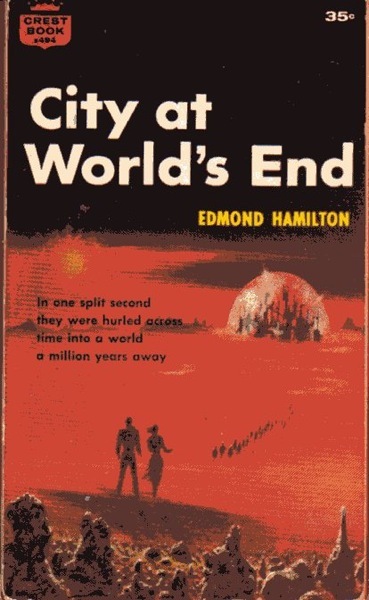 That sounds like "City at World's End" by Edmond Hamilton, 1951. The town had something to do with advanced weapons development, which was why they believe they were targeted by a first strike. A quote to check: "That furry brute is a technician?" They eventually revive the Earth by heating up the core of the planet.